For an organisation not recently renowned for quick and decisive action, Rugby Australia’s handling of a delicate matter has been as swift as it has been sensible. A process that I feared might be glacial has been anything but. And that’s as much a talking point as what kicked off the process in the first place. It’s also not just RA, with the NSW Rugby Union closely in tow. The Rugby Union Players Association has been cautious and practical when in most other circumstances it might have been provocative and belligerent. The National Rugby League closed its door as a potential destination almost as quickly as it was first mentioned. Japan and France probably still loom as the most likely locations for Folau to continue playing professional rugby, though it was notable that Japanese captain Michael Leitch had published his strongly-worded “I’m calling you out” social video less than a day after Folau’s inflammatory posts. It would be fascinating to know if the Japanese Rugby Football Union is of the same opinion as the Brave Blossoms skipper, and whether a Top League contract would be approved. Equally fascinating was the response of French club Toulon’s owner, Mourad Boudjellal, who swiftly ended the line of thinking many of us probably had about the Top 14 giants. “The guy is a moron, he must leave. Or you have to buy a brain,” he told French sporting outlet L’Equipe on Friday. You must be really on the nose if not even Boudjellal will have you. With more doors seemingly closing on him than opening, and just as Rugby Australia did the day before, Folau late on Friday made the only decision he could. He’s going to fight for his livelihood. NSW followed up by standing their fullback down indefinitely. It was left to RUPA to confirm the request for a Code of Conduct hearing. “It is RUPA’s position that any disciplinary action must be dealt with in accordance with the Rugby AU Professional Player Code of Conduct,” their statement read. And if that doesn’t fill you with any great feeling of a union backing their member to the bloody end, you’ll love the closing lines. “RUPA will continue to offer our support to Israel as required. But where everything up to now has been quick – Folau’s original posts, RA’s immediate condemnation, followed by their swift “intention to terminate” decision – the next steps won’t be quite so. No date has been set for the Code of Conduct hearing. Meaning a situation that escalated quickly will now be drawn out for some time. Even if it is to what still feels like an inevitable conclusion. Sponsors are again ready to walk, which only adds to the ‘bringing the game into disrepute’ angle of proceedings. Indeed, with conflicting reports as to the status of specific social media clauses in Folau’s new, four-year, $4 million contract, the disrepute charge may be the ace up RA’s sleeve, having reportedly informed Folau on Friday that they intend to follow through with their intent to terminate. The big question remains whether Folau really can produce the “compelling mitigating factors” RA invited in their Thursday evening statement. You could imagine he will continue to believe he makes his comments from a position of love and wanting to help people receive God’s love. Equally, you could imagine that RA will reiterate that his chosen ‘my way or the highway’ road to this redemption is a rather large part of the problem. But this still feels like a line-in-the-sand moment. 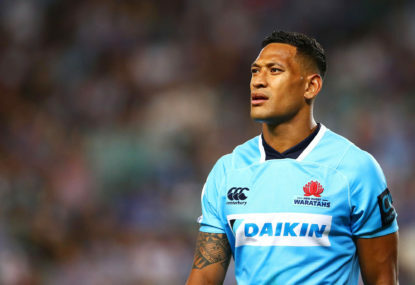 Folau will fight to continue his professional livelihood in Australian rugby, but in just a couple of days, he’s plummeted from the being the face of the game to being more trouble than he’s worth – a commodity with a ‘dump at all costs’ order attached. Not even his on-field presence seems likely to save him. 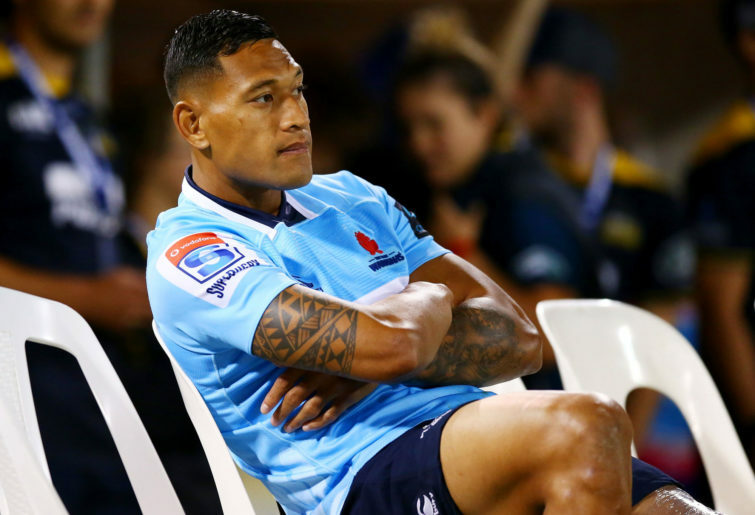 Folau will fight to continue his professional livelihood. But Australian rugby is now fighting for its professional livelihood, too. And Australian rugby is playing a far bigger game than Israel Folau.